Anaïs and Vincent, parents of César, 2, left Paris in 2016 to settle in the Lyon region. 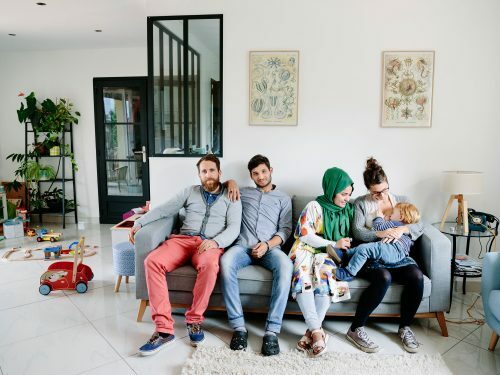 Their new life has allowed them to open their doors to an Afghan refugee couple, Zulfeqar (second from left) and Battarine. Once they had arrived at their destination, Zulfeqar and Battarine believed they were at the end of their ordeal but they were homeless and had to alternate for months between street life and emergency accommodation. The family’s welcome has been a great relief for them: ‘Anais and Vincent are so nice to us. It’s going well,’ the refugee couple said.